I really have missed sharing some of my daughters hairstyles and thought I would start up again. 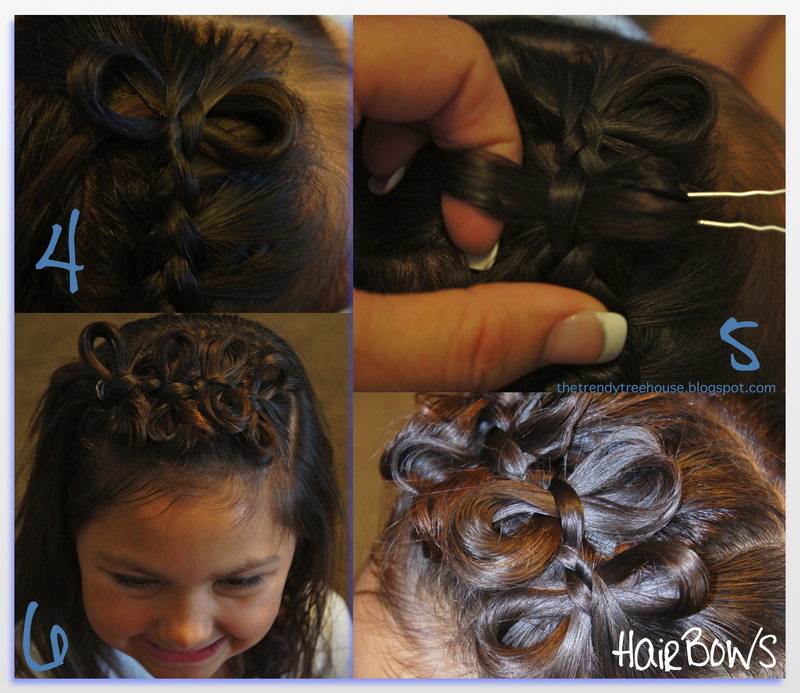 Today I am sharing the "HairBow Bangs"hairstyle. You can use the HairBOW in so many different styles, so I am going to share a few in the coming weeks. Don't forget to check back. They will be cute!!! Get this...you will want to buy some hair pins. They are perfect for this hairstyle and you can get them really cheap at beauty supply store. NOT this...regular bobby pins can work but make it harder to get a clean looking bow. So I don't recommend it. 1...divide the hair on top, leaving the sides down. I just separated a square on the top of her head and put the rest of the hair out of the way in a pony tail. Part the hair leaving a small section in the back for later use. Make an inside out french braid in the front. 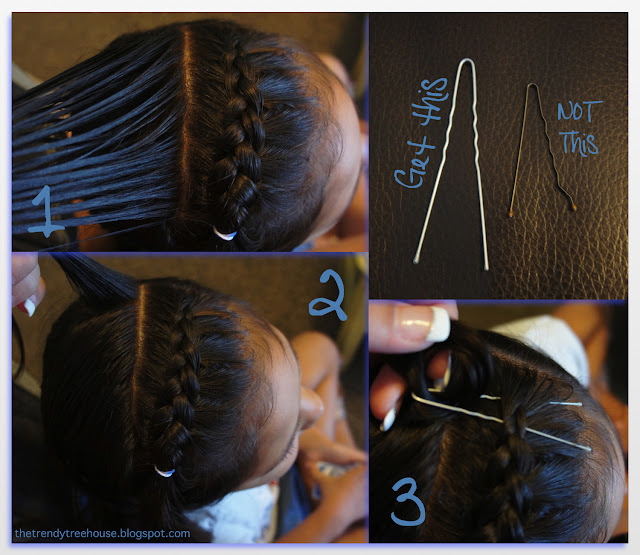 3...slide your hairpin under one section of your braid and place the loop inside the pin. 4...place your finger back in the loop. Pull the hair pin back through to the other side. Don't take your finger out of the loop yet, you want to pull and slide the hair making a loop. Once your loop is done, remove the hair pin. You have your first bow. 5...you will have a little hair left over if your hair is long like my daughters. Just add that hair into your next loop. Continue loop and bows into each braid or every other braid. I did every other leaving a space but every section would be cute too! When you reach the end you can either work it into a braid or just finish with a pony. Hers is a pony. 6...the finished look. You can leave the hair down or put it into a pony tail. We did both. She wanted it up later. This hairstyle is so cute. I guarantee you will get lots of oooo's and aaaa's. We do! The other thing I like about these bows is they stay in very well. After a long day of running around, my daughters bows looked the same. Ok, may be a few wispies here and there, but very nice. She has even slept on them before and woke up looking good. 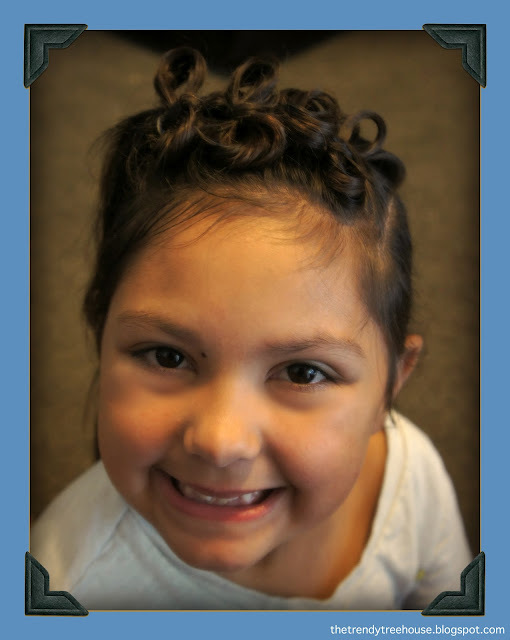 Next week I will be sharing the "Headband HairBows" Hairstyle. If you need help with this hairstyle....please email me at trendytreehouse@me.com I am happy to help. You are definitely in the running for Mom of the Year. LOL So many little girls would love to get their hair done like that.